We have mentioned Vector Based Gesture Icons for Touch Screen Interfaces earlier. Now we have got GestureWorks that ships with a library of over 200 built-in gestures. Open Source Gesture Library is built upon an open source gesture framework, allowing developers to customize and extend the “gesture object” to create support for new gestures. 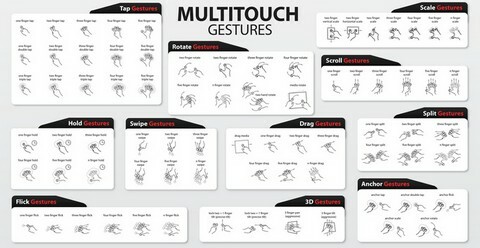 You can download all free gesture and multitouch illustrations and icons. A variety of formats including scaleable formats are available.